The optional brass flag is for use on the Medium and Large Westchester. The color of the flag will be the same as the mailbox ordered. 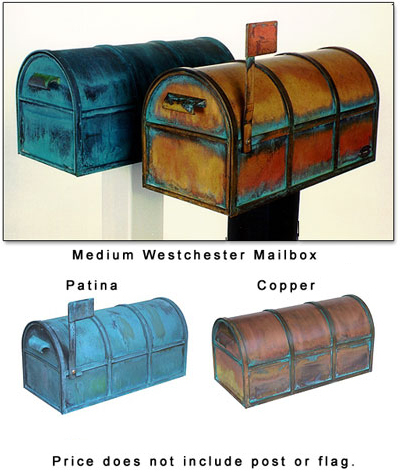 The Copper and Patina Westchester mailboxes are handmade of solid brass, using brass bar stock and thick brass sheet. Each mailbox is available in either the popular Patina finish, or the most popular Copper finish. The painted Westchester mailboxes are made of solid aluminum. Copper: An uncoated natural brass finish with varying degrees of red, yellow, and brown. Borders are highlighted with hardened blue-green patina. Has varying degrees of sheen. Colors deepen and sheen dulls slightly with age. Patina: A powdery, blue-green uncoated natural brass finish with a dark, brownish-black base. Darkens slightly with age.